I've been making my own tomato pasta sauce for a while now, I make a huge batch every few months when tomatoes are cheap at the store (or if we have them in the garden) and share it out with family and friends. Home made sauce is so much nicer than store bought even if it is messy and probably not any cheaper to make. On Thursday my Mum surprised us with a quick visit. She had a wonderful gift for me too. My very own Jamie Oliver pasta machine. Wow lucky me! And I can't believe it is blue too! My favourite-in-the-whole-world colour. Of course we had to try it out straight away, so we had fresh home made pasta for dinner that night. For some reason I already had pasta making flour (TIPO 00) in the cupboard. I was on my own making the dough which was a golden colour due to the lovely golden yolk in Puffle's chicken egg. Mr W helped to crank the dough through the machine, it was really fun to do. Unfortunately I had run out of my own tomato sauce and my new crop of basil still isn't big enough to make pesto so we used our emergency store bought sauce. The pasta was delicious and I have pushed making a new batch of tomato sauce to the top of my to do list. Mum suggested we get one of those pasta drying racks. But do I really need to spend $50-$90 on a rack when I could make my own? Better yet as my clothes airing rack is almost always out why not just place some strips of baking paper over a few rails and use that. *Prezzie (also spelled as pressie) means gift or present. 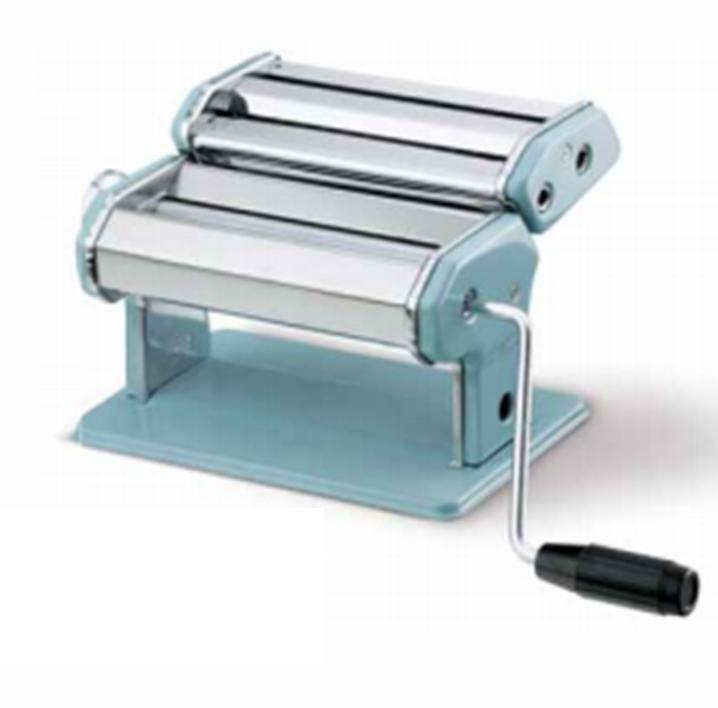 I inherited a pasta machine like that only an older version and I do dry my past on my clothes drying rack. I use the baking paper and tape it over the rails. Works perfectly and I don't have to find room for another rack in my cupboards when not in use. You will love the machine! What a wonderful present. I had one many years ago, my father, who is now deceased, loved spaghetti and made fresh spaghetti part of the deal when he sold me his house so he could retire to a beach in Mexico and only come back to the states once a year. During the short time he was home we had a weekly spaghetti or lasagna dinner. My pay to him for really low interest rate at a time when interest rates for mortgages here ran about 10%. I still make pasta, but at my age and with a disability I've graduated to an electric machine. You will enjoy for years to come! !